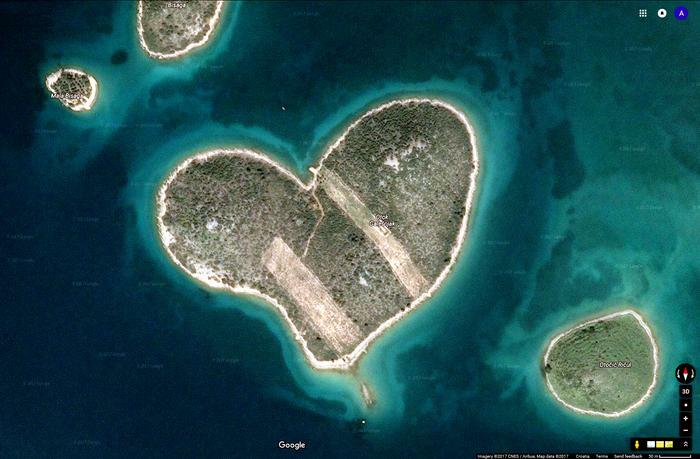 In Croatia the nature itself decided to prove that love exists and created a beautiful heart-shaped island Galešnjak in the Adriatic - today renowned as the ''Croatian island of love''. Love is everywhere around us, sometimes we just need to look a bit harder to see it. This small uninhabited island is situated in North Dalmatia, just between Turanj town in Zadar Riviera on the mainland and the island of Pašman. Covered in forest and few olive trees, the island is also known as home to numerous rabbits. With a surface area of only 0,132 square kilometers, this wonder of nature was accidentally ''discovered'' in 2009 by Google Earth and it instantly became a global hit after being promoted by CNN and BBC. Everyone learned then about Galešnjak - the most perfectly heart-shaped island in the world - which greatly contributed to the promotion of the Adriatic as a top destination for a unique and unforgettable vacation. In close vicinity of Galešnjak there are beautiful islands such as Ugljan, Pašman, Dugi otok and amazing Kornati islands. If you want to go romantic in this special place and spend a few days in North Dalmatia you can stay on Dugi otok island or some other popular location such as Zadar on the mainland for example. In Zadar you'll find a great choice of attractions, activities and historical sights. While some think there's no point to Valentine's Day, others don't waste their time and come up with different ways to make their better half happy. As lovers' holiday, Valentine's Day is just a small yearly reminder that we can still make some effort to show our love, and surprise the loved one. Sometimes it's hard to choose the perfect gift for the person you love - perfumes, books, watches or flowers are classic, but a romantic trip is a gift that will certainly be remembered forever.